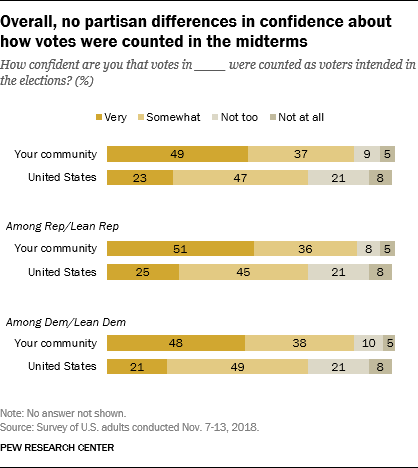 Most Americans are at least somewhat confident that votes were counted as voters intended in the midterm elections both in their local communities and across the United States. More than eight-in-ten (86%) say that they are at least somewhat confident that votes in their local community were counted accurately and seven-in-ten (70%) say the same about votes across the country. Overall, there are no partisan differences in confidence about the vote count: 87% of Republicans and Republican leaners, and a similar share of Democrats and Democratic leaners (86%) say they are at least somewhat confident that votes in their local communities were counted accurately. Views of elections across the country also differ little by party. Overall confidence that votes were counted as intended are similar to confidence that votes would be counted as intended in a survey conducted about a month before the election. A majority of Republicans and Republican leaners (70%) are very or somewhat confident that votes across the U.S. were counted as intended. That is slightly lower than the share of Republicans who expressed confidence in an accurate vote count before the election (77%). Democrats’ confidence in the vote count across the country is little different than before the election. As a result, while Republicans had expressed slightly more confidence than Democrats before the election, there is now no partisan divide in these views. 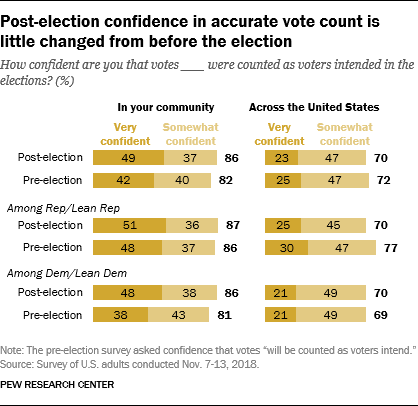 When it comes to confidence in the vote count in their local communities, Democrats are now slightly more confident than they were before the election (86% at least somewhat confident, up from 81% in October). 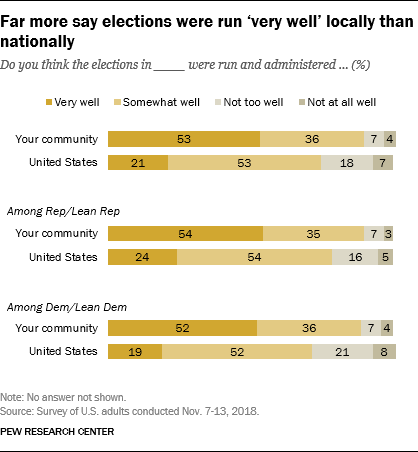 Views about election administration follow a similar pattern: 89% say elections were run at least somewhat well in their communities (53% say very well), while 74% say elections across the country were run and administered at least somewhat well (21% very well). While there are no partisan differences in overall views of election administration in their communities, Democrats remain somewhat less likely than Republicans to say elections across the country were run and administered at least somewhat well (71% vs. 78%). While about half of Americans overall say that they are very confident votes in their community were counted accurately, that figure is somewhat lower among those living in states with gubernatorial or senatorial races where the outcome had not yet been determined when the survey was in the field. 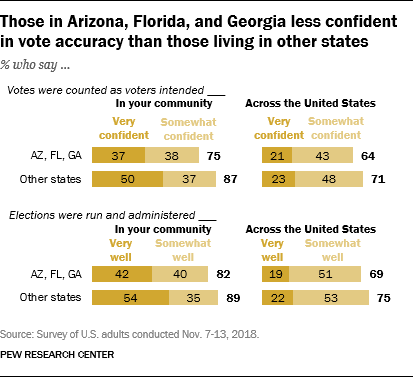 Residents of Arizona, Florida and Georgia express less confidence in the way votes were counted in their communities compared with those in other states: 75% say they are at least somewhat confident votes in their community were counted accurately, including 37% who say they are “very confident. By comparison, 87% of those in other states say they are at least somewhat confident in vote counts in their community, including 50% who say they are very confident. The pattern is similar, though less pronounced, in views of election administration in their states and in views about elections across the country. Note: The sampling design and sample sizes at the state level does not allow for reporting within individual states; however, in a model (also controlling for key demographics), confidence is lower in these individual states than in other states.